The Kali Temple in South Calcutta is over 260 years old. This was an area where mainly Brahmin communities lived earlier. The temple exterior is freshly painted every few years and there may even have been some modern architectural features added to its spires. However within the temple, the deities have remained in their respective places for years and rain or shine, continue to draw huge numbers every evening during the ‘Sandhya Arti’. However I must admit, Kalighat is not what it used to be and while passing the area, over the past 4 or 5 years, I kept telling myself that I must stop the next time I happened to be passing through. Finally I managed to do just that, just a bit worried that since the winds of change have blown through every corner of India, they would surely not have left this sacred and colourful area undisturbed. Hence the visit to the Kalighat area and if possible to the Kali temple, was definitely called for. It was a cool cloudy day and I hoped that the cloud cover would last long enough for me to check out the whole length of Kalighat Road. My target was also to take a few photographs of the lane in front of the Kali temple, which is always more colourful than the rest of the area. I made it well in time. The street was as colourful as a mela. There were all sorts of interesting things being sold at the pavement stalls. The stall owners were rather amused to find a female clicking away with a camera, instead of shopping. 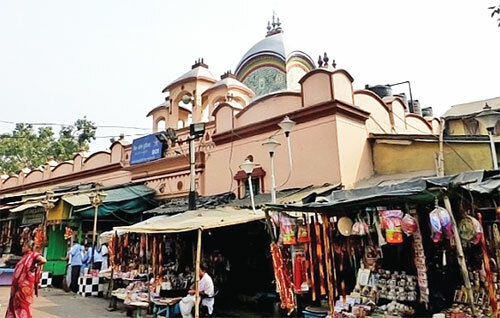 To keep everyone happy I decided that such an opportunity might not come up again soon and decided to begin at one end and find out exactly how much had changed in Kalighat over the years. I began with a shop selling metal ware—brass cooking utensils, thalis and katoris in all sizes and shapes of were heaped up next to metal images of various deities. Also prominent were the shola decorations for weddings and pujas. I zeroed in on a tiny brass Nand Gopal, which had caught my eye. This was to be my first buy for a friend who has a collection of gods and goddesses from all over the sub-continent. As I moved on, I noticed that the popular Kalighat toys seemed to be missing. These were wooden toys of kings and queens painted in red, green, yellow and black. They were carved out of a type of light wood, into a distinctive shape-flat at the back with the front coming to a point. I remember having some of these toys up on the wall in my house about a decade ago and it seemed a good idea to buy some of these as gifts. After asking many of the shopkeepers, I was finally told that wooden toys were not being made any more, since customers had lost interest in folk art. The only wooden images that are still being made are images of Goddess Lakshmi’s owls in many different sizes. This made sense, after all with prices shooting up in every sphere, one needed to ensure Lakshmi’s blessings. I was delighted to be able to buy a whole family of owls, in three different sizes from a shop that specialised in these. The shopkeeper, when asked about the Kalighat toys, ventured a suggestion, that with wood becoming scarce and hence more expensive, the craftsmen have more-or-less decided to turn to other sources of income. In these eco-sensitive days that seemed to be as good a reason as any. Another casualty that I noticed was the absence of large wooden bowls, traditionally used for keeping rock salt. No doubt the lack of customers must have also wiped out this cottage industry. It was sad to think that in these days of iodised salt that come neatly packaged in plastic packets, who needs wooden bowls? But there were other things that had not changed. The huge array of gaily painted images of gods and goddesses, the sankha and red bangles that most married women in Bengal wear, the alta and the sindhoor—these were all still there. The new additions were glass bangles, fake silver jewellery designed in the latest styles and plastic clips and hair bands. The There were also rings and metal bangles of all kinds, in copper, brass and iron— to ward off Shani's evil eye, there were rings set with colourful stones. The gamchas, which have now become very fashionable, appeared to have more varieties. They were somewhat swamped by fancy jute and cloth shopping bags and similarly, along with the marigold garlands being sold on the pavements, there were more artificial flowers in the shops than the real ones on the pavement. The other favourites that seem to have disappeared - the pink budhiya ka bal and son papri sellers were absent, and in their place, the man selling Walls Ice Cream was doing a brisk trade. But the balloon man was there and so was the puchka man, next to the coconut seller, just like before. Every one interested in Indian art knows about the humourous Kalighat paintings that are now much sought after by art lovers. These were originally caricatures of the lifestyle of the rich and famous of the time, created by the talented Kalighat artists in the 18th and 19th centuries— in a typical folk style. The good part is that there are plenty of these still being made these days. Perhaps they are not as satirical and humorous as the originals, but at least they are still to be seen—not in Kalighat but in art galleries and high-brow craft showrooms. As I neared the Kali temple, there seemed to be plenty of activity at the shops located outside the temple entrance. Here there seemed to be brisk business in red scarves with golden fringes, and marigold garlands. The red scarves seemed to be a new addition, no doubt a north Indian influence, which has proved good for business. There were men and women in equal numbers going in and out, and there was a lively carnival atmosphere to it all. Just as I was debating with myself about going inside the temple, I noticed a panda sizing me up as a likely customer – enough reason for me to decide that my visit to Ma Kali would have to wait till later. As though she had also decided that this was not the day for a darshan, at that very moment there was a clap of thunder and a sudden sharp wind that sent a couple of sign boards flying. Everyone ran helter-skelter and clutching my shopping bag I ran to look for my car. The raindrops began pelting down, and before I knew it I was drenched to the bone. But I had managed to save most of my photographs and also made a few purchases in Kalighat, a place that despite all the changes, still continues to be worth visiting and is as colourful as before. The next date for a visit and the missed darshan, will have to be carefully planned after checking the weather report!